Returning to its regular schedule March 3rd…. 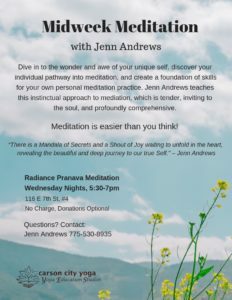 Radiance Pranava Meditation as taught by Jenn Andrews is a highly personalized practice and one that is designed to honor the unique life of every student. What YOU love becomes the basis, the starting point and the foundation of your meditation practice. This instinctual style of meditation embraces and accepts your unique desires and longing for the richness of life. In this process, we are on a path of intimacy and our meditation is our loving attention to the Self. Radiance Pranava Meditation is based on years of study with Camille Maureen and Dr. Lorin Roche. There is no charge for this class, and donations are optional. Donations support the time and energy of the teacher, and help to support the space.